We’ve done some fantastic Women in Comics interviews, and we’re psyched to have had the chance to chat with artist Amy Reeder. 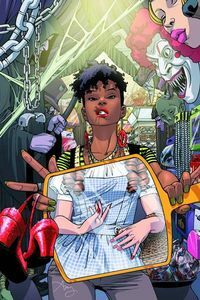 We loved her work on Madame Xanadu and Batwoman and are looking forward to her upcoming one-shot with Brandon Montclare from Image Comics, Halloween Eve. We talked with Amy about her history in the comics industry, what she’s personally struggled with, and what’s coming next. Make sure to check out our four-page preview of Halloween Eve–looks like a lot of fun! TFAW.com: What are your earliest memories of comics? What was the first comic you read? Amy Reeder: My first experience with comics or even comics stores was when I became a fan of Sailor Moon in 1997. I would go to comic shops to find whatever paraphernalia they had . . . back then there wasn’t much manga, even. I think the first comic I read was Blue Monday, probably in 2003. That was when I graduated college. So I’m sort of late to the game! TFAW.com: What inspired you to become an artist, and when did you first begin to explore that creative outlet? AR: I used to draw here and there . . . some people didn’t even know I was an artist. But when I drew, it was copying photographs, and I was pretty good at it. I couldn’t draw out of my own head, though. I gave up on that until I started getting into manga after college and realized that if I actually tried, I could probably teach myself to draw! And it turned out that I learned really fast. I think it’s because I’m not one of those artists who always sees something wrong with my stuff. If I’m in control of it, I really do love it, like I sit there and pat myself on the back. It’s gross. So when I first started learning, and I’d see great results, it became an addiction and all I could ever think about or do was improve at art. It was such a rush. TFAW.com: What attracted you to Halloween Eve? AR: The biggest thing was that it came from the mind of Brandon Montclare. I wanted to work with him. He’s a friend of mine — we’re very close, and part of that is because the guy really knows his stuff. He’s smart, he cares, he believes in me, and he knows how to make stories that matter. He suggested doing a Halloween story, and I knew that he would do it wonderfully, and that we would get along. I will say I was nervous about drawing all the costumes in the store — I’d drawn a costume shop before in my Tokyopop book Fool’s Gold and it’s a lot of work! But I actually had loads of fun . . . on Halloween, anything goes, so I relied a lot more on my imagination, rather than reference. TFAW.com: What’s going to surprise or intrigue readers the most? AR: Hmm, I think it’s the level of quality, really. Like everything has been so cared for . . . this is by far my best work ever. And the story really takes you places . . . I think it’s pretty unpredictable, and yet it fits together like a glove. While drawing it I kept telling Brandon, “I think people are going to freak!” So I hope we’re right! TFAW.com: How has your experience been, working with Image Comics? AR: Oh, they’ve been great. We’ve just sent the book to the printer, so I’ve had a lot of interactions with most of the staff as of late. And it’s all been good . . . you can tell they care, and that’s what matters most to me, working with a publisher. It’s also really nice to be associated with all the titles in the imprint . . . we all know Image has been creating a lot of buzz for quality comics. TFAW.com: What’s your favorite part of telling stories in the sequential arts? AR: Drawing faces, definitely. I’m obsessed with faces, all different types, and coming up with very specific expressions. Now that I’m coloring and inking, I can be even more exact with it. It’s the acting, I guess. And that’s what I look for in other people’s art as well. I get into it because of the acting. TFAW.com: What aspect of comics have you struggled with, as a creator? AR: I struggle with a lot of the things that most comics artists are really great at. I am still learning to draw men well. Fight scenes are hard for me if it involves realistic combat, because I’ve just never paid much attention to that sort of thing. Even more difficult is drawing armor, guns — things that are more stereotypically “male,” honestly. Which is tough because a lot of this is the focus in comics. But I do want to get better, and I hope I will. TFAW.com: What advice can you give aspiring comic book creators? AR: Make like-minded friends (even if it’s online) and help each other get published. Also, always draw the absolute best you know how . . . and then some. Try the things you’re bad at until you’re good at them — don’t let your strengths be the crutch that keeps you from growing. TFAW.com: What was the last comic you read? AR: Becky Cloonan’s Batman one-shot! Awesome! TFAW.com: What has your experience been like, as a female creator? AR: It’s been all over the map. Sometimes I’ve been given really great chances that have probably been beyond my abilities because people in the industry want to support diversity. I think I’ve been recognized more often because I’m female, too. Other times have been no-so-great, but I’ve never experienced anything blatantly sexist. I get self conscious a lot — like I worry that when I stand up for myself it sounds more abrasive because I’m not a dude slapping another dude on the shoulder, like “F-you, man! Haha.” Or, my style is pretty feminine — I think it’s tough to get publishers and editors behind that sometimes, even though I’ve been shown time and time again that the audience is there. It’s made me examine myself a lot and where I exist in the gender spectrum, when I’d rather not even have to think about it. TFAW.com: Who’s one woman in comics that you admire? AR: One?! Okay, well I really love Jill Thompson. She does it all — she writes, she watercolors, she does things for herself. And she seems really happy. Not to mention she’s incredibly talented. Oh, and strong. Physically. I have a picture of her fake-throwing me out of a restaurant! But seriously, Beasts of Burden broke my heart, Little Endless is amazing, and Scary Godmother is the best. She’s the queen of Halloween! TFAW.com: What are three things you think comic book publishers should be doing to attract female readers? AR: You know, this is tough, because I have realized that a lot of people genuinely do not know what attracts females. Like I just wish I could be in charge of it somehow. But the safest bet is to hire women on more projects, and listen to their opinions, because most of us really do get it. Hold on to these creators and these titles, even if they aren’t your top sellers, because we need a continuous influx of new readers in order to sustain the industry. And a huge well to dip into is the female readership. TFAW.com: What other projects do you have coming up? AR: I am figuring that out right at the moment! I will probably have some new creator-owned project going because that’s going really well right now, but I might do some other things as well. I hope to have something awesome to announce by New York Comic Con! Our thanks again to Amy for an excellent interview. Make sure to pre-order Halloween Eve for a little extra fun this month. What’s your favorite Amy Reeder comic? Post your comments below! TFAW’s Geek Trivia Battle Royale: A Fight to the Finish! TFAW.com Interviews Hack/Slash‘s Tim Seeley!